^ Funky landing gear The parts came grouped in ziplock bags, in a sturdy corrugated box and well protected with copious amounts of foam peanuts. Casting quality is excellent. Details and panel lines are sharp. 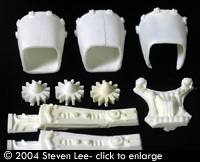 Hollow cast areas, around the cockpit tub and the engine cowls, are thin and consistant. There were very few bubbles evident in my sample, most notably a couple on the landing skids, and 2 on the detail piece that sits in back between the engines. There are a few minimal seam mismatches along the engine cowls that would easily be dispatched with a bit of putty and some light sanding. Aside from these minor issues, this kit is one of the best cast garage kits I’ve seen. 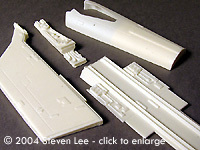 This model was superbly mastered by Alfred Wong. 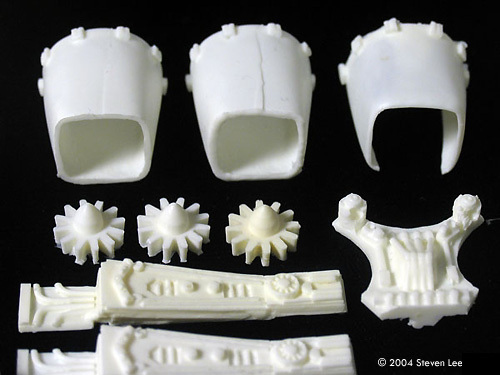 Parts fit is excellent and the parts layout is straightforward. Surface detailing is comprised of engraved panel lines, and raised and engraved details, giving a nice depth and complexity to the model. The inclusion of a detailed cockpit tub is a nice touch. The cockpit is embellished with dials and instrument clusters and although they look a bit exaggerated, will carry through well under the canopy. A pilot’s seat, control stick (you can see the “turbo” button!) and pilot figure round out the interior features. 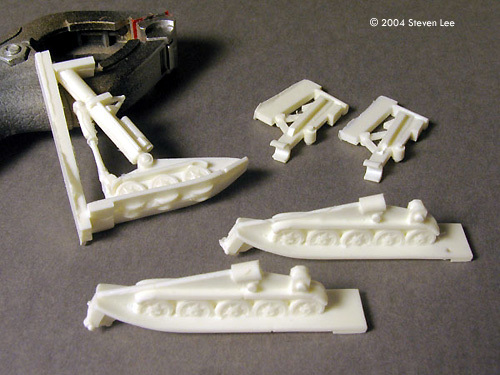 The landing gear looks accurate compared to published blueprint sets from the show. It’s a peculiar combination of landing skid and in-line wheels. The struts are nicely done with oleos and hydraulic details. The only thing that bothers me is that there are no real gear bays. But who knows. This may actually be the way it was on the show. Decals are sharply printed and are complete compared to the markings seen onscreen. 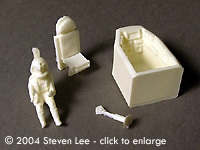 Overall proportions and detail seem accurate to stills of the original filming miniature. 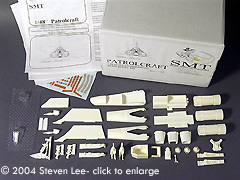 Is $80 too much for an 8" long, 1:48 scale kit? With 37 parts, detailed cockpit, landing gear option, 2 pilot figures, and option to build either the two or single seater, SMT’s Patrol Ship is definitely worth it! Many thanks to Steven's wallet for providing the review samples. Manufacturers and retailers, interested in getting your wares reviewed and publicized on a site averaging 3500+ readers a day? Contact us! This page copyright © 2004 Starship Modeler. Last updated on 20 September 2004.